Yesterday, Kara asked me if I'd do a quick race with her today. She mentioned a few hills some stairs about 5 miles overall (well it was 6 up a mountain). It's for a good cause so I figured an hour drive on a Saturday, was cool. The BERGKÖNIG "Mountain King" Run. This run practically broke me in half the 2nd and 3rd miles and the rest wasn't a walk in the park! These hills were relentless in length and equally as steep. The hills were no joke; I don't know if the word hill even explains it? I had tossed around the idea of just laying down to die a few times; however, I dug deep and pulled through the hills and charged up at least 100' of stairs to the Tower, atop Lapham Peak. I was warmed up and felt good after the stairs, must have been around mile 4? The decent down was great, ran into 1 big hill, but was able to overcome and what goes up must come down to the finish line. This was the hardest run I've done (at least when it comes to leg burning hills) since Duck Hill or the 8 mile run up to Kolekole Pass (which is atop a mountain) in Hawaii. 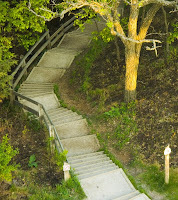 I found a picture of part of the stairs and one of the trail doing a Google search. I wish I would've taken pictures while I was running; this was such a cool run. The climb was tough, but the run wasn't as bad as I make it sound. For the last 15 minutes of the run, I made a simple phone call and saved a ton of $ by switching to Geiko! 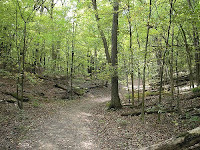 I'm definitely going to start running trails more; this picture is not of a steep part it's a rather relaxed part of the trail. And I do believe I forgot to mention, Kara and I both were beat by 2- 60+ year old men. Animals, they ran like animals!